There is music that is made with a dull commercial purpose, and then there is music like ENTHRAL. In other words, music that is made for explorations, deviations, and for grasping the essence of the dark. The Norwegians have been around since 1995, and it has been almost a decade since is predecessor Subterranean Movement was released. Now, after a minor lineup change, ENTHRAL’s fourth full-length baptized to Obtenebrate is here to cast a shadow over us all, and it is spiked with 70 minutes of beautiful death and black infused metal. From the very beginning of the instrumental intro Obtenebrate, followed by the mastodontic piece The Gospel of Woe, we are greeted with a sound that is as cold as steel, and that has an imposing heaviness spreading out from the speakers. The melodies generated by Gunnhild Bratset’s guitar are played close to the pleasant verge of being disharmonic, almost melancholic at times. Lay Waste the Crops is more of an in-your-face blackened piece, with sharp guitars and is fueled with intensive drumming hammering in to your most protected innards. There is actually a groovy undertone flickering through here and there, and perhaps it is coming from the base (Kai Åsvik: VIRUS, GRIND CHRUSHER, WHIP) that is keeping the pulse throughout it all. The songs all have their own subtle characters but still there is an interwoven theme throughout them all; unexpected halts and sudden heaviness reminding you of the existence of gravity, pounding rhythms and wailing tunes. Vocally, Kjetil Hektoen (also on drums: LEGIONES, CREST OF DARKNESS, SJODOGG) reminds a bit of SATYRICON’s Satyr, sounding very harsh, rasping, and ghoul-like. In some of the songs, such as in both The Gospel of Woe and Pallbearer, there is a playful interaction between the rhythm section and the riffs and melodies played by the the guitars, which is a nice contrast to the more conventional riffing. In addition, Pallbearer contains a dark thickness and roughness that is rounded off by smoother yet sharp passages, and this is consistent throughout Sepulchre as well. 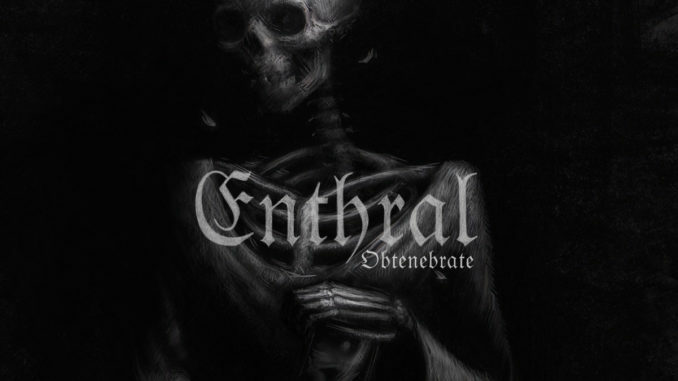 It is hard to draw any clear parallels to other bands, since ENTHRAL basically has something of an eclectic sound, incorporating elements from both black metal, as well as the more sophisticated sides of death metal. The songs are multifaceted and filled with details, yet in whole Obtenebrate is controlled and the noise is well-composed. The shifting between fiery intensity and more calmer paces works to the advantage of my personal favorite On to the Never, as well as to Within the Tomb, and an unfocused listener will easily loose their grip of the songs since they are basically changing throughout. The final burst of energy is extruded in Death’s drum, only to step-wise be into a melancholic tone, and eventually fade out. The albums main disadvantage is its verbose character, with perhaps a few too-many repetitions of certain similar-sounding regions, but this is a minor comment, because in whole Obtenebrate contains some real gems and is a good investment for your record collection.